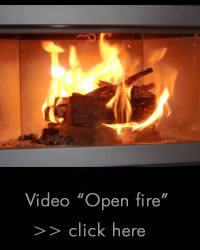 For each open fireplace, stove, wood stove, etc., make sure that the logs have an appropriate size. As a rule of thumb the logs should not be longer than two-thirds of the firebox size. It should also be noted, that the combustion chamber is not overloaded. Per 1 kg of wood about 4.2 kW heating energy is released. Therefore, the stove should be filled with an appropriate amount of wood. That means when filled with about 2 kg of wood, about 8.4 kW heating energy are released. If the stove has now a heating capacity of only 7kW, ​​the fireplace is overloaded and can be damaged. lit from above and burns from the top . The fire is now burning down from the top. The furnace runs properly if the flames are long and yellow. When the combustion runs poor without long yellow flames, soot particles are formed, which can be found e.g. in the corners of the stove windows. For a low pollutant and particulate air pollution a good wood stock is also important. Wood should not be stored in basements or garages. An ideal solutuon is a storage timber before a north oriented wall. The distance between the wood and the wall should be about 10 cm. Also the space between the floor to the bottom of the timber should also be 10 cm - just as the distance between roof and timber. >>> German Version "Heizen mit Holz"